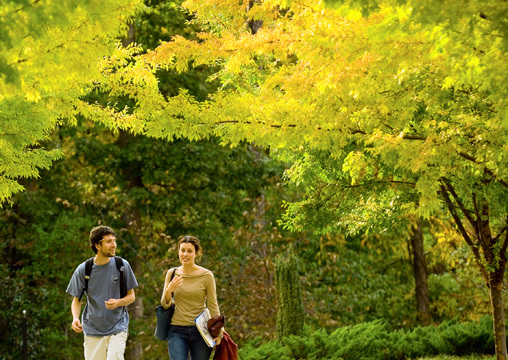 UNCG’s campus is cited by students, faculty and staff as a beautiful and inspiring place to learn and work. In December, the Arbor Day Foundation honored UNCG as a 2009 Tree Campus USA University for its dedication to campus forestry management and environmental stewardship. UNCG is only the fourth college or university in North Carolina and the first in the UNC System to receive the award. The university’s commitment to the environment goes beyond planting and protecting trees and maintaining a stunning campus. In 2009, UNCG broke ground on the LEED-certified School of Education building. We also will break ground on our first LEED-certified residence hall and served as host to two sustainability symposiums. One, UNC Focus Forward, was a virtual system-wide symposium promoting best practices. In addition, UNCG recently hired a new Sustainability Coordinator for Operations. Richard McDonald works with supervisors within the operations areas of campus (facilities, purchasing, dining, parking, etc.) on issues like waste reduction, energy efficiency, green building, green cleaning and more. His main focus is to assist in identifying, implementing and tracking progress toward the university’s sustainability goals.